We hope everyone had an awesome 4th of July! "Discover a world of real people and authentic experiences off the beaten path and beyond the reach of travel guidebooks..."
People-First Tourism is an incredible initiative started by a group of professors at North Carolina State University, who are working on a program called FORK to FARMER to make it easier for tourists to connect with locals, offering an alternative to the do-nothing vacation. The Table is honored to be featured in this month's initiative along with Asheboro's Back to Earth Farm. "When The Table opened up it was a God-send for us, because that's exactly how we like to eat. We like real food made from scratch. We understand what goes into what they're doing there. We appreciate it, and we always want to support that," explains Tom Henslee, Owner of Back to Earth Farm. 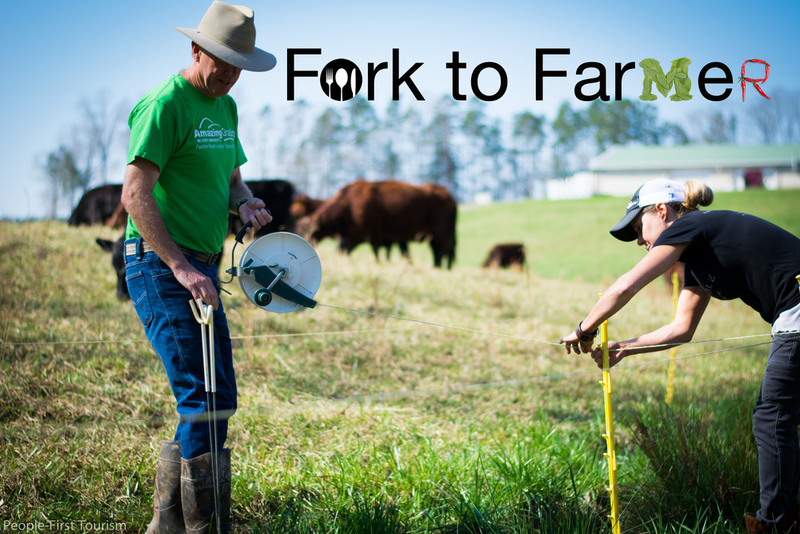 Click here to check out an inspiring, 8-minute video featuring The Table's Founder & Owner Dustie Gregson and Executive Chef Deanna Clement speak on their amazing partnership with Back to Earth Farm's Owners Tom, Janice and Alice Henslee. To find out more about People-First Tourism, you can check out their Facebook page and visit their website here. And go out and support local famers! "We order a new batch of coffee beans every week so our customers are always getting the freshest beans, because freshness is of the utmost importance here at The Table." Counter Culture Coffee has recently found a place on the shelves of local, big chain grocery stores, but you can count on us to always have the freshest and most interesting offerings from our coffee-roasting friends in Durham. We love to stock single origin beans and limited release blends both for brewed coffee in-house and on the shelf for you to brew at home. Because we value freshness and excellent flavor, we won't sell roasted beans that're more than two weeks old. After a visit to the Farmer's Market, drop by for a perfect morning at The Table. Breakfast and fresh coffee are waiting for you! "Whenever we have naturally bright, fruity coffees in the espresso grinder (quite often because we love them in all their uniqueness), we put double shots on ice with seltzer water and a tasteful dash of housemade orange syrup to create a refreshing, interesting way to enjoy cold coffee." REMEMBER...The Pastry Box is available now! 2 different boxed assorted "mini" pastries for your life's events. Place your order in advance as it takes 2 business days to complete. Pick up and order from either our Asheboro (336-736-8628) or Greensboro (336-542-0395) locations. Our coffee-to-go carafes are a great addition to your pastry boxes! Each carafe includes our freshly-brewed Counter Culture Coffee, Homeland Creamery Cream, Selection of Sugars and 12 8-oz. cups ($22). Blackberry & white chocolate bread pudding (pictured above). The Table in Asheboro will soon have a designated pick-up line for carry-out orders and bakery items. Good news, everyone! We've seen the need to expedite ordering and limit long lines. So, starting next month, you may call in a carry-out order. Pick up your treats from the right-side entrance next to The Market. The Olive Oil & Sea Salt Loaf is a classic. It pairs well with fresh, heirloom tomatoes, mozzarella, basil and balsamic vinaigrette. It also makes a great summer BLT! Fresh market zucchini & roasted tomato quiche is available at The Table on Elm (pictured above). Both Table locations will be the closed the week of Labor Day for annual building maintenance and staff vacations. Our last day open will be Saturday, September 3, and we will re-open on Tuesday, September 13.